Dingo Mini Dental Chews for Total Care help clean and strengthen teeth for a healthy smile! 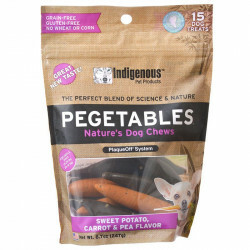 These tasty, wholesome chews will turn your pet's gross doggy breath into a sparkling, pristine aroma as fresh as a waterfall on a winter's morning. Contains Vitamin E to help support healthy gums. Resealable package keeps treats fresh. Ingredients: Wheat Gluten, Glycerin, Pineapple Fiber, Gelatin, Modified Starch, Natural Chicken Liver Flavor, Titanium Dioxide (color), Palm Oil, Calcium Carbonate, Fructooligosaccharide, Sodium Propionate (preservative), Sugar, Alpha Tocopheryl Acetate (source of vitamin E). I used to be able to get these at the pet store, Wal-Mart and Walgreens. NO one carries them any longer. My dog loves them. He gets one every night. I am so glad I found them online.THANK you so much for offering these. They are a life saver for me. They are so crazy for these!! My two small dogs just love these chews. One can't eat them fast enough and the other has to hide hers and watch it first for awhile. There is never one that goes to waste!! Out of all of the dental treats we've tried with our Weimaraner, these are by far the best. They appear easier to chew and break up in smaller parts, that alleviate any getting stuck in a dog's throat. We've been buying these for about 7 years and highly recommend them. 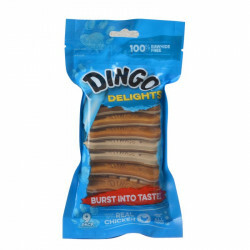 Our two dogs get so excited when it's time for one of their Dingo Treats. We've been giving them these treats for three years now and they act like its their first. One prances around the house with it hanging out of her mouth for a few minutes before she eats it. Both dogs take off for a different room in the house to eat it. Never had a dog this crazy about a certain kind of treat. 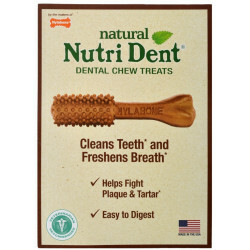 My Cocker Spaniel, Mickey, loves these Dingo Dental Treats and expects one after our morning walk. They are getting very difficult to find in our area...."what's up with that"? Well, I found them at Pet Mountain and ordered 20 bags. Mickey is happy, and I'm happy with Pet Mountain's customer service, delivery, price...it's all good! 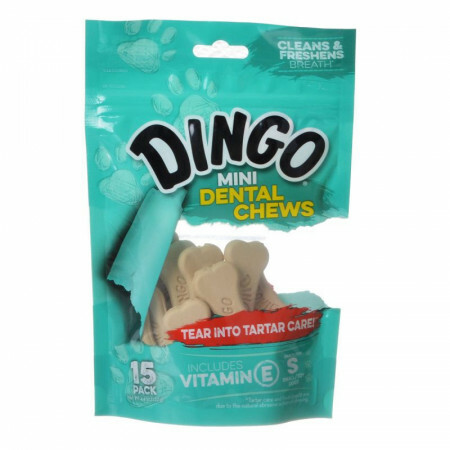 Our two dogs love love love the dingo dental chews. They get one a day and start letting us know that it's the time of day they get it. One of them puts it in her mouth and prances around the house with head held high looking for just the right spot to eat it. The other dog goes in the opposite direction. We were starting to panic because we were getting them from either Walmart or Target but both places will carry them for awhile, then stop for months and then get them. This time both places were out and no empty slot on the shelves for them. Had to google and be willing to pay shipping. Just didn't have the heart to run completely out of them. They arrived just in time and we'll continue to order from this supplier. Arrived quickly, thank goodness.